This article is about the thieves found in the wilderness. For other uses, see Thief. Thieves are random NPCs that can be randomly encountered in the wilderness. There is a 25% chance they will appear as a male Argonian, a 25% chance of appearing as a male Dunmer, a 25% chance of appearing as a female Dunmer and a 25% chance of appearing as a male Khajiit. They will simply be named "Thief" when you see them in gameplay. They all wear leveled light armor, a cuirass and a pair of boots with a 50% chance of a pair of gauntlets, all items leveled to glass quality at level 36. To hide their face they will wear either a mage hood or a torturer's hood. They will always carry a lockpick, two leveled daggers (up to Daedric quality at level 46), a level-dependent gem, and a few gold coins. They will approach you and demand gold. They can be paid off, bargained with, or, if you are a member of the Thieves Guild, persuaded to walk away. They will show extra respect if you are a Nightingale. Additionally, if you are wearing any piece of Nightingale armor, the thieves will offer you "your cut". 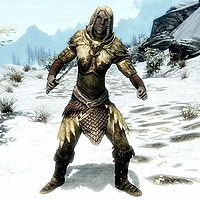 If wearing a piece of regular or improved Thieves Guild armor, they will give some gold or a few lockpicks as a gesture of goodwill. If you wear a piece of Nightingale armor, they will greet you with deference: "Hail, Nightingale! Luck has shined down on me and made me a rich man [sic]. Here is your cut, as promised." 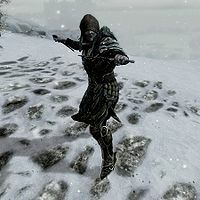 Likewise, if you wear a piece of Thieves Guild armor, they will say, "Hail, brother/sister! I saw you walking there and thought you could use this." Either way, they will leave you with some gold or lockpicks, wishing you well: "Good luck out there!" If you are not wearing Nightingale armor or Thieves Guild armor, they will threaten you: "All right, hand over your valuables, or I'll gut you like a fish." You have a variety of possible responses with differing outcomes. If you fail to persuade or intimidate them, they will tell you, "I'm not going to ask again." and you can try your remaining options. "Walk away. Right now. (Intimidate)"
"Do I look like I have any money? (Persuade)"
"Of course! I've seen you at the Flagon. My mistake. Good luck out there!" "A Nightingale? Oh, I had no idea. My apologies. Good luck out there!" If you are the Guild Master of the Thieves Guild, they do not have the dialogue responses to recognize you as such, and will treat you with hostility. This page was last modified on 25 April 2015, at 19:52.